The 1980 Anniversaries Issue consisted of six stamps. 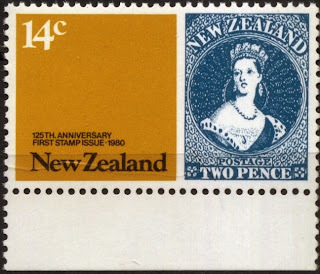 Three were celebrating the 125th anniversary of stamps in New Zealand and the rest celebrated three other anniversaries. There was also a miniature sheet issued at the same time, featuring the three Chalon Stamps. 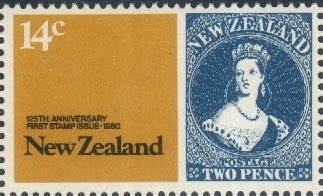 The first stamp issue, the Full-faced Queens is also know as Chalon Stamps. 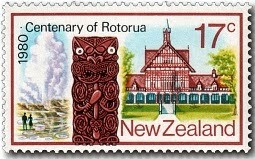 The three stamps commemorating the 125th anniversary of the first New Zealand stamp issue were designed by D A Hatcher, these stamps were also incorporated into a special miniature sheet which he also designed. 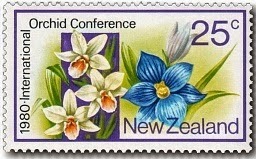 The remaining three stamps, designed by R M Conly, commemorated the Centenary of Rotorua and the International Orchid Conference and the World Ploughing Championships which were both held in New Zealand in 1980. Further down we have included a small collection of flaws and printing errors from these stamps. 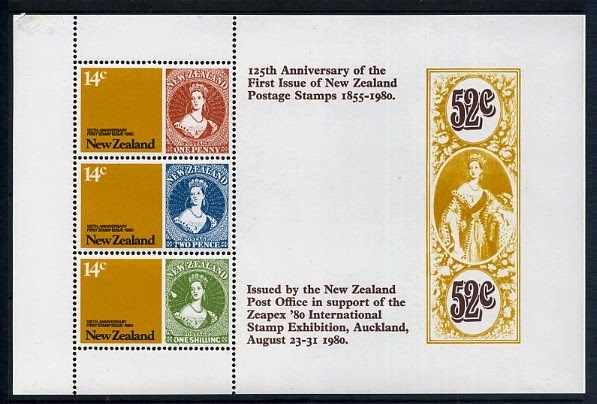 14c x 3 A set of three stamps printed se tenant marked the 125th anniversary of the first New Zealand postage stamps. The stamps featured reproductions of the first New Zealand stamps depicting Queen Victoria. These first stamps, known as Full-Faced Queens because of the portrait pose of the Queen, have always been considered as special since most stamps showed Side-Faced views of the Queen. 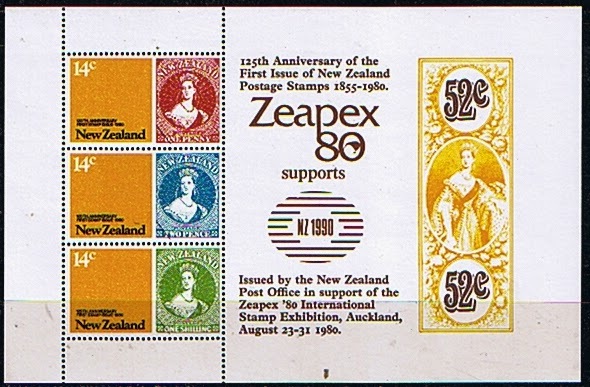 To reproduce the original stamps again in 1980 was a outstanding idea, well received by the philatelic world as something very different, especially for the large stamp exhibition held in Auckland a few months later. We have included the original stamps on the right for you to compare. 14c with image of the 1855 1d Red shown on the right. 14c with image of the 1855 2d Blue shown on the right. 14c with image of the 1855 1/- Green shown on the right. A montage of scenes characteristic of Rotorua commemorating the centenary of an agreement between the Chief Judge of the Native Land Court and local Maori Chiefs to establish a township near Ohinemutu on 25 November 1880. The scenes shown are Whakarewarewa with Pohutu Geyser on the left, a section from a carved post in the centre and the Bathhouse on the right. 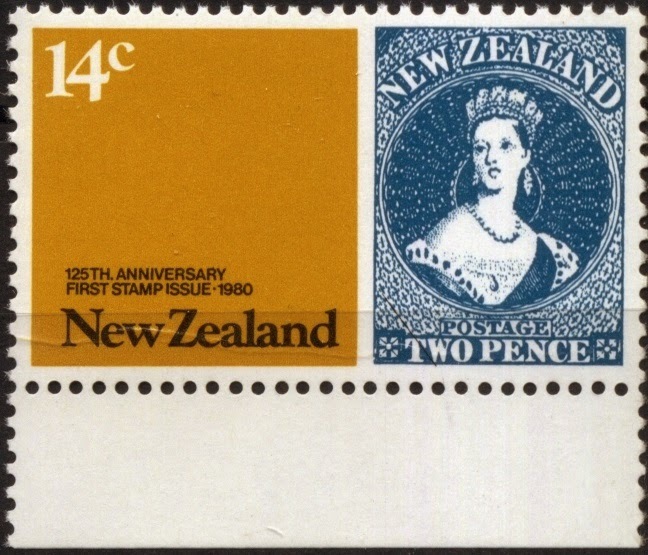 Held in Auckland in October 1980 - the stamp design depicted enlarged versions of Earina autumnalis and Thelymitra venosa. Held at Lincoln Agricultural College near Christchurch in May 1980, the World Ploughing Championships involved ploughmen and supporters from Europe, Asia and the Americas, as well as those from Australasia. Only two years before this, in 1978, Lincoln College had celebrated their own centenary. See our post 1978 Agriculture Lincoln College Centenary. 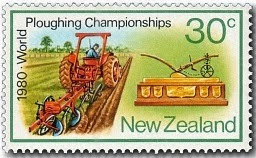 The stamp included a representation of the Golden Plough trophy. Notice the mistake made in this picture. The right wheel of the tractor is running over ploughed soil, something a farmer would never do. 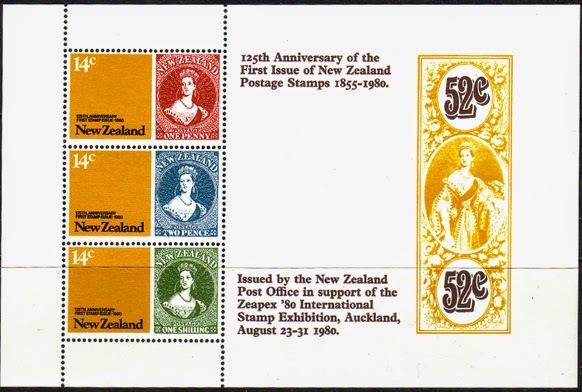 Special miniature sheet including the three 14c stamps. held in Auckland, August 23-31, 1980. It seems that all the errors from this issue are found in the three Chalon stamps. They are also mainly concerning the black. In this strip above the black is completely omitted. These two special collector blocks show major shifts of the black. 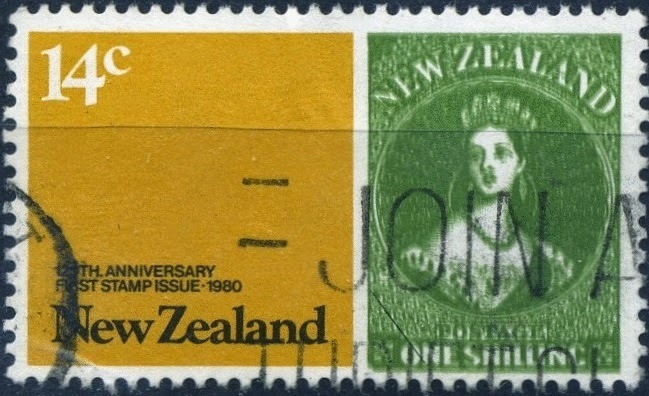 In the Value Block above the black has moved down and to the right so far that "New Zealand" is partly off the design. This shift can also be seen in the colour taps in the top selvage. The black tap is much lower compared to the other four colours. In the Plate Black below a vertical colour shift has caused the selvage details to move across the perforation almost touching the design of the stamps. Notice the row of plate number on the bottom selvage to the right, the last black '1A' is well out of place. 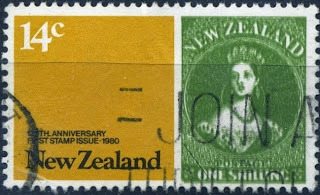 The left-hand stamp shows a double print of the green which shows a darker, blurred image. The right-hand stamp show a pre-printing crease which has effected the design. This is best seen behind the words "New Zealand" but a closer look will reveal some damage to the Chalon image as well. The final error, probably the one this issue is most known for, is found on the miniature sheet. While not being as specular as some of those above, this flaw effected a lot more stamps. It was also found and was announced at the Zeapex Exhibition which quickly made it popular with collectors. If you look to the left of the Queen's face in the Green stamp, you will see a small white triangular mark. Some people have called this the Zeapex flaw although it is not known to have appeared in the overprinted sheets.